ZDZ Events 2013 - 2014 - Zeta Phi Beta Sorority, Inc. Zeta Delta Zeta Chapter Serving Burlington County, N.J.
Join the ladies of Zeta Delta Zeta for our annual Finerwomanhood Scholarship Luncheon entitled 'A Day of Tribute' featuring Phenomenal leaders in Zeta and the Burlington County community. 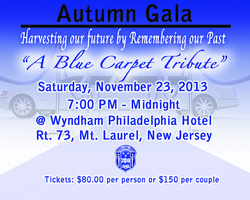 Join the ladies of Zeta Delta Zeta as we host a fun filled night of dinner and dancing at our bi-annual Autumn Gala entitled 'A Blue Carpet Tribute'. Cocktail hour begins at 7:00 pm with dinner and live entertainment from 8:00 pm - Midnight. Entertainment will be provided by To the Max Band. Proceeds for this event benefit our scholarship endeavors, chapter management & community programs.